Heads-up party people. Don't trade your glow sticks for hot water bottles just yet. Your raving days are not over! Award-winning Family Rave organisers Big Fish Little Fish offer family-friendly dance parties for the post-rave generation of parents. Gather your miniature Melbourne shufflers and hop down to Chasers Nightclub in South Yarra on 22 July from 2 - 5pm for the next BFLF Event. Show the youngsters how it's done! 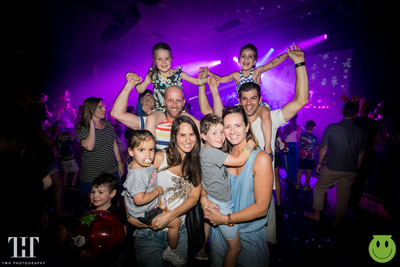 Bust a move with your kids on the dance floor to International DJ superstar Anthony Pappa's tunes. Don't fret about little one's ear drums; the music is set at safe sound levels. Each BFLF Event offers quality tunes (house/rave/techno/classics), glitter cannons, bubbles, giant balloons and parachute dance finale. There's a licensed bar, free transfers and glow sticks (see?!). Kids can throw some shapes, craft or chill. There's a playdoh table, a play area set up with tents and tunnels and a baby chillout space with mats and a big soft-play ball pool. You are invited to dress up in your colourful, quirky and creative costumes. Perhaps you'll be a magician for the afternoon, an acrobat, clown, lion tamer or beaded lady? 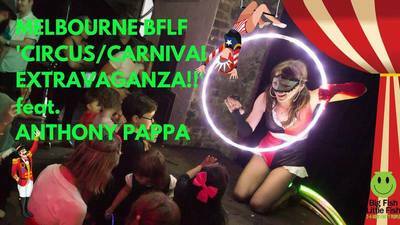 Don't miss the next Big Fish Little Fish 'Circus/Carnival Extravaganza' Family Rave feat. Anthony Pappa.